SMACK! Santa Rosa Players' production of Kiss of the Spider Woman, the musical, plants a nice, sloppy wet one square on the mug, and you just gotta love it. Director Ross M. Hagee creates a rousing evening of musical theater from one of the most improbable source works (first a novel, then a film, then a theater piece) ever to hit the boards singing. It's weird, really weird, but works splendidly as an expressionistic tour de force of song and dance. Kiss of the Spider Woman details the unlikely relationship between hotheaded Marxist revolutionary Valentin (Jon Rathjen) and Molina (Steven Abbot), a motor-mouthed gay window-dresser and cineaste forced to share a cramped South American prison cell. Oppression is a drag, dreams liberate, love conquers all. Abbot (a dead ringer for a young Peter O'Toole--he's all cheekbones) draws Molina as an affectionate, tragicomic figure through spitfire delivery, acid glances, and soulful singing. Abbot is marvelous and is one of the few local players able to steal a scene from himself: Though he's a compelling Molina, the actor seems a trifle more interesting than his character. Rathjen's Valentin proves the perfect foil for Molina's antics--he's the straight man in more ways than one, though his machismo melts as the odd couple's emotional needs seep past the chalk line drawn on the cell floor. Bonnie Brooks is stunning as the Spider Woman (a sort of Lady Death for the arachnid set) and Aurora, the femme fatale that sashays through Molina's glitz and glam imagination. Though the ham-handed acting of the play's officious minor characters sometimes threatens an otherwise seamless show, the Players reveal a heretofore hidden ability to pull off high camp and irony with ease. Santa Rosa Players' Kiss of the Spider Woman plays through Sunday, March 28, at the 709 Davis St., Santa Rosa. $10-$12. 544-7827. ACTORS' THEATRE opens its Women Playwrights Festival 99 with Catherine Butterfield's Joined at the Head, a seriocomic head-trip through the mores of mortality served open face on wry with American cheese directed by Kathy Juarez. While on a promotional tour for her new book, firecracker author Maggie Mulroney (Sheila Groves) makes a pit stop in hometown Boston to visit her old high school flame (Eliot Fintushel) and his wife, also named Maggie (Danielle Cain), who's dying of cancer. Despite the disparity of their personal experience, the two women bond and soon a rattling starts at the emotional floodgates. 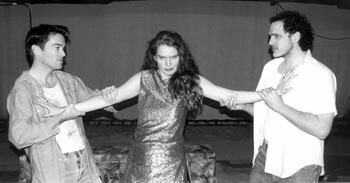 Author Maggie narrates the play, leading it to an onstage self-deconstruction when she's interrupted by her counterpart, who disapproves of its schmaltzy story line. Together, the Maggies chisel the fourth wall's mortar until they're practically dueling over the play's treatment of the life issues facing the cancer patient. Sheila Groves is first-rate as the play's reluctant heroine and possesses the uncanny ability to serve up its abundant sophistry as philosophical revelation. Likewise, Cain massages her Maggie's pluck and intrepid life lust safely past the maudlin traps that would catch a lesser actress. Joined at the Head is an interesting work well handled by accomplished performers and is a joy despite its occasionally awkward preciousness. Joined at the Head plays through April 10 at Actors' Theatre at the LBC, 50 Mark West Spring Road, Santa Rosa. $6 to $12. The Women Playwrights Festival 99 continues through March with staged readings and the Fringe Festival. 523-4185. From the March 11-17, 1999 issue of the Sonoma County Independent.